Heat a large 9 or 10 inch non-stick skillet over medium-low heat and toss in the spinach leaves, the white parts of the green onions and the jalapeño. Add a few drops of water and cook, stirring frequently, for 8 to 10 minutes or until the spinach leaves are wilted. Add a few more drops of water if the pan becomes too dry. When the spinach has wilted, remove from the pan and set aside. Wipe down the pan with paper towel. Meanwhile, break the eggs into a bowl and add the green parts of the green onions and the dried oregano. Beat lightly with a fork. Return the pan to the stove, add the olive oil, and turn up the heat to medium. When the oil is hot, pour in the eggs and stir gently with the back of a fork for 30 seconds. Cook for 2 to 3 minutes or until the eggs are almost set, loosening the edges occasionally with a spatula and tilting the pan to let the uncooked eggs reach the surface of the pan. Add the wilted spinach mixture, ¼ cup of the Feta cheese, and the grape tomatoes and olives to the middle of the omelette. Let the eggs cook for another 20 to 30 seconds until they’re set. Tap the handle of the pan sharply with your fist to loosen the omelette and then fold it over with a fork or spatula. 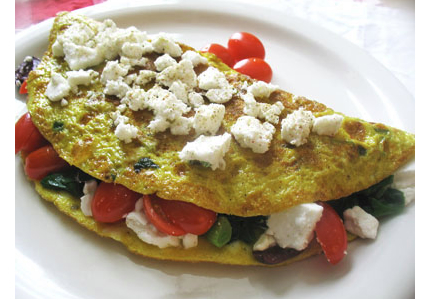 Slide the omelette onto a plate, scatter the remaining Feta cheese over top, and season with salt and black pepper to taste. Serve right away.